Investing.com – Will the Fed cave in to Donald Trump and lower interest rates? The gold market would sure like to know. 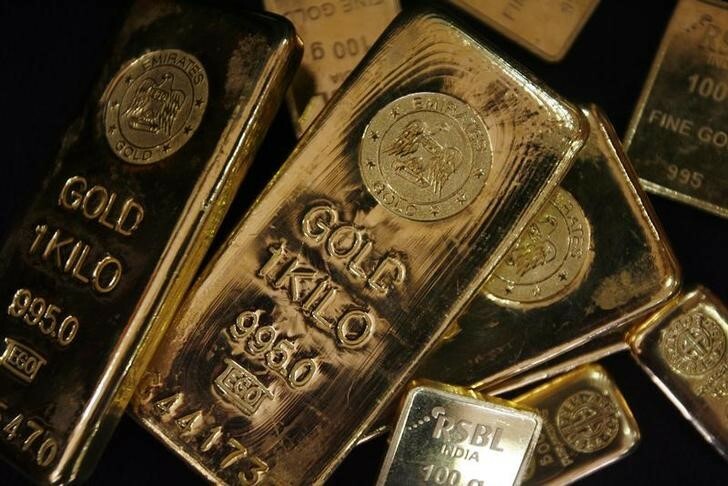 Bullion, as well as futures of gold, hit $1,300 levels for the first time in more than a week on Monday as the U.S. president’s demands that the Federal Reserve turn its current rate pause into an easing cycle attracted bids for the precious metal from hedge funds to true gold lovers. Gold also was driven up by headlines that China has expanded its gold reserves for the fourth-straight month. Spot gold, reflective of trades in bullion, was up $6.17, or 0.5%, at $1,297.72 an ounce by 1:56 PM ET (17:56 GMT), after hitting $1,303.78 earlier, its highest since March 28. Gold futures for June delivery, traded on the Comex division of the New York Mercantile Exchange, settled the official session up $6.30, or 0.5%, at $1,301.90 per ounce. It hit a one-week high of $1,307.85 earlier in the day. The Fed hasn’t responded to Trump’s demand for lower interest rates. But the central bank is due to release on Wednesday its March meeting minutes, which may provide a chance for those reading the tea leaves to see where the central bank may be going with rates. Fed Vice Chairman Richard Clarida is also due to speak at an event Tuesday. Separately, Trump has nominated Stephen Moore and Herman Cain to the Federal Reserve board of governors, with a majority in a CNBC Fed Survey of fund managers, economists and strategists saying the two shouldn’t be confirmed by the Senate as they were deemed unqualified. “Oversold gold (is) rebounding due to some pullback in the dollar and more worries related to U.S. political headlines,” said George Gero, precious metals analyst at RBC Wealth Management in New York. The U.S. dollar index, which measures the greenback’s strength against a basket of six major currencies, fell by 0.4% to 96.63. Optimism that central banks globally will add to their holdings in gold after the China buying also underpinned Monday’s rally. The People’s Bank of China raised reserves to 60.62 million ounces in March from 60.26 million a month earlier, according to data on its website. In tonnage terms, last month’s inflow was 11.2 tons, following the addition of 9.95 toms in February, 11.8 tons in January and 9.95 tons in December 2018. Palladium rose after a two-day slide to remain the world’s priciest metal. Spot palladium was up $10.85, or 0.8%, at $1,383.15 an ounce. The silvery-white auto-catalyst metal, used for purifying gasoline emissions, traded some $300 above gold early last month before cutting that premium to about less than $100 lately. Palladium futures up $7.80, or 0.6%, at $1,353.70 per ounce. Platinum futures up $8.10, or 0.9%, at $913.50 per ounce. Silver futures up 13 cents, or 0.8%, at $15.21 per ounce. Copper futures up 4 cents, or 1.4%, at $2.94 per pound.